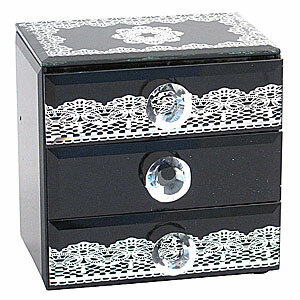 A highly decorative Mirrored 3 Drawer Box - Silver (Box height 13cm x length 13cm x width 10cm). This will make an ideal small silver jewellery box or bedroom storage place for all your easy to lose little items. Each mirrored effect box contains three slide out drawers, with clear crystal type handles, that come with a soft black felt lining to keep your rings or necklaces safe. 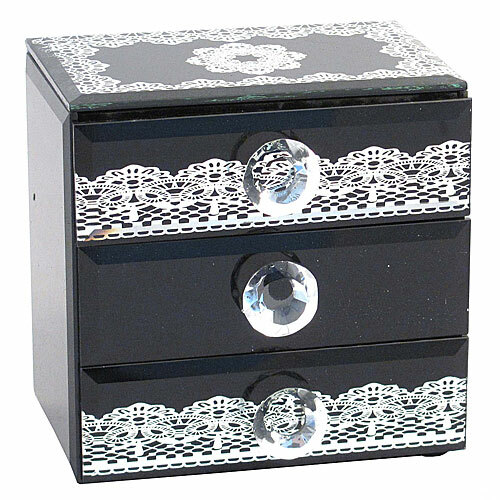 A great silver and black jewellery box gift to someone special. Go on treat yourself.